Our stunning gold centrepiece collection addition. A beautiful gold crackle bubble vase filled with exquisite silk flowers creating a luxurious bouquet in a bubble display for your wedding or event tables. 80cm Tall Flute vase filled with LED Gel and a light base underneath to illuminate the display, Each Table centrepiece then has a selection of flower stems and Floral Grass in the top in your event colour theme! Great for Large Events, Corporate Parties and Awards Evenings! ​A delicate glass bubble vase filled with shimmering acrylic chips and a selection of artificial flower heads, bear grass wrapped in the vase and placed on a mirror plate and a sprinkle of sparkling diamantes. A variety of flower heads and colours available. LED Lights can be added to make this an Illuminated Display! A beautiful LED display to make an impact for daytime and evening table centrepieces! A glass bubble vase filled with shimmering acrylic chippings, silk flower heads, wrapped bear grass and place upon a bed of vines. Bubble vase complete with white or cream LED pillar candle sat amongst decorative sand. Beautiful vines of lilies are then wrapped around the inside of the vase and the vase is placed on a large mirror plate a sprinkle of Diamantes to complete. 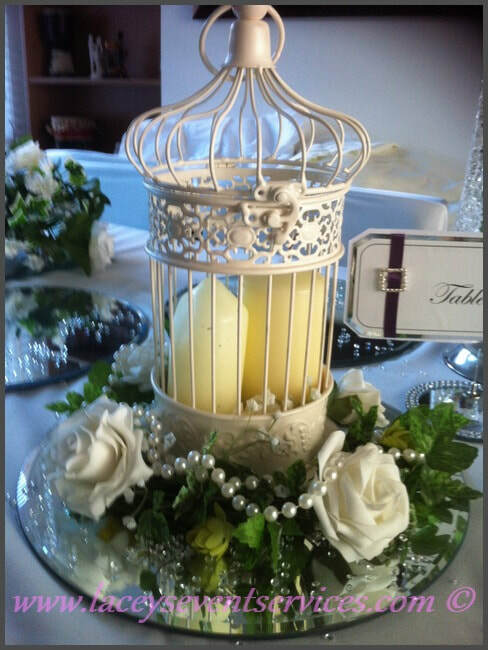 Ornate vintage birdcage holding an LED pillar candle on a bed of green and white. Surrounded with an artificial foliage and flower ring. A luxurious organza or lace ribbon tied in a bow around the birdcage and placed on a mirror plate with a sprinkle of diamantes. Luxurious 75cm tall silver 5 arm candelabra with moveable arms and solid base complete with LED taper candles. Placed on a mirror plate with diamante scatter at the base! Ask us to add artificial ivy foilage entwined around the candelabras from tip to base to create a luxury vintage look. A stunning tall silver candelabra with LED candles and a beautiful display of silk hydrangea blooms. We place the display on a mirror plate and add a scatter of diamantes to the base to complete. 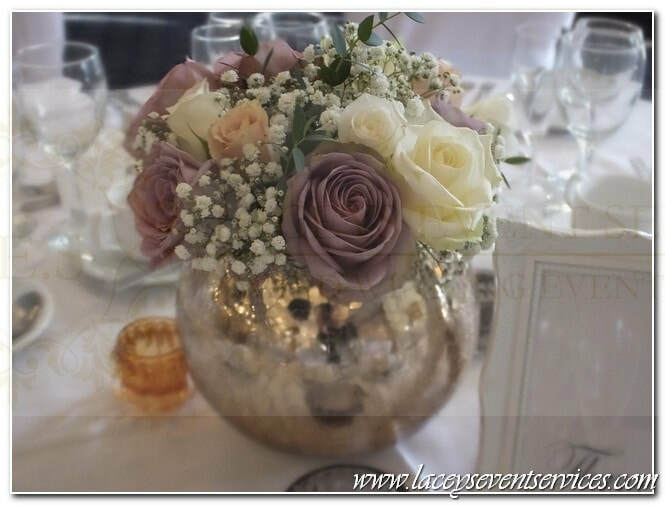 ​If you are looking to add an accent colour we can insert coloured roses to compliment your wedding theme! Our 75cm Tall white candelabra With crystal garlands hanging from each of the 5 cups as standard (These cannot be removed) makes for a perfect Winter Wondrerland inspired event or even a Vintage Chic theme! This white candelabra comes standing on mirror plate with 5 LED Church Candles and scatter diamantes. ​60cm Tall Clear Glass Martini Vase filled with shimmering acrylic chippings or coloured voile and topped with a ball of artificial roses. Placed on a mirror plate with a sprinkle of diamantes. Great for Company Balls, Corporate events and evening functions this tall table display comes complete with coloured gel and bright LED light placed on a mirror plate with a sprinkle of diamantes. Gel is available in most colours to suit your Evenings theme and LED light will last around 48 hours so great for late night parties! 60cm Illuminated LED Crystal Chandelier style centrepiece. Guaranteed to really give the WOW factor at any event! Complete with mirror base plate and scatter diamantes. LED Centrepieces are great for Corporate Evening Table Centrepieces, Awards Evenings and Company Functions! Our Tropical Fern Centrepiece is a great table display for Caribbean Themed Events or Jungle Theme Events. Standing over 1.5m tall on the table you can guarantee the WOW factor with this Tall Fern Centrepiece. Each display is placed on a mirror plate with a scatter of diamante. Large 60cm tall martini vase with an elaborate design of artificial flowers placed on top. Each display of flowers comes in main colour of white and a coloured voile can be added to each display to match your event colour theme! Display comes complete with mirror plate and scatter diamantes. An LED light can be added to the vase to make this an Illuminated table centrepiece! Great for Christmas Parties. 60cm Tall clear martini vase filled with water, coloured petals or acrylic stones and topped with a selection of floating candles. The vase is then displayed on top of a mirror plate and a sprinkle of diamantes. Standing over 1.5 meter high this piece comprises of tall flute vase with a large selection of Ostrich feathers displayed in the top and light reflecting beads in the vase. Each piece is placed on a base which shoots 16 rays of light up through the vase creating a soft illuminated glow to the chippings and the feathers. We place the entire piece on a mirror plate and add a sprinkle of diamantes. Manzanita crystal trees are perfect for Winter Wonderland and Christmas Events! Each white manzanita tree is decorated with hanging crystal garlands and if you would like them lit we can add fairy lighting around the tree branches for an Illuminated LED Evening centrepiece! To create this Low LED Table centrepiece we use 3 cylinder vases in varying heights and widths to create an asymmetric display. 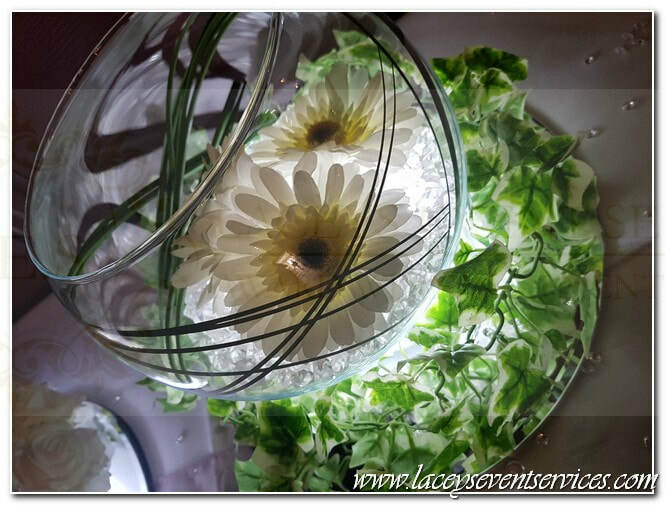 Each vase contains LED gel then flower stems in your event colour are added to each vase. Each display of vases is placed on a mirror plate and ribbons or diamante strips are placed around the top of each vase if desired. A scatter of diamantes completes this display. A trio of cylinder vases with white decor sand in the bottom of each and then filled with beautiful pink cherry blossom make this a perfect soft and romantic table centrepiece. Each display is placed on a mirror plate with a scatter of diamante. This LED Low Table centrepiece is great if you have alot of product on your table. The simple white orchid inside the vase stands in LED gel of your colour choice. Each display comes complete with mirror plate & a scatter of diamantes. Our 70cm tall conic vases with a set display of artificial flowers to the top and stems inside vase. Each vase is placed on a mirror plate and diamante scatter are placed around the base. Flowers can be arranged in most colours. 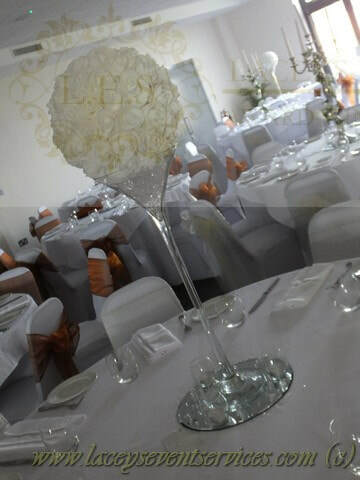 Wonderful crystal globe ball sitting 50cm high above your wedding tables. An LED tea light candle is placed inside each crystal ball centrepiece which reflects the light beautifully around the display. Each display is positioned on a mirror plate and a sprinkle of diamantes on the base. 60cm Tall and 20cm diameter cylinder vase filled with White or Pink Cherry Blossom for an Oriental Twist to your Banquet Tables! Each vase can be filled with Coloured Sand or we can use LED Gel to create an Illuminated Display perfect for Evening Events & Parties. Mirror Plates & Diamante Scatter are supplied for under each display. We love our wide cylinder vase displayed with a large pomander of white and ivory flowers on top, draped with pearls around the vase and inside holding white decorative sand, a romantic LED wax candle and more matching flowers. This display stands over 1m high and comes complete with mirror plate and diamante scatter. Standing at a whopping 1.7m high above the table this statement oversized LED Table centerpiece is very popular for the more exclusive event. 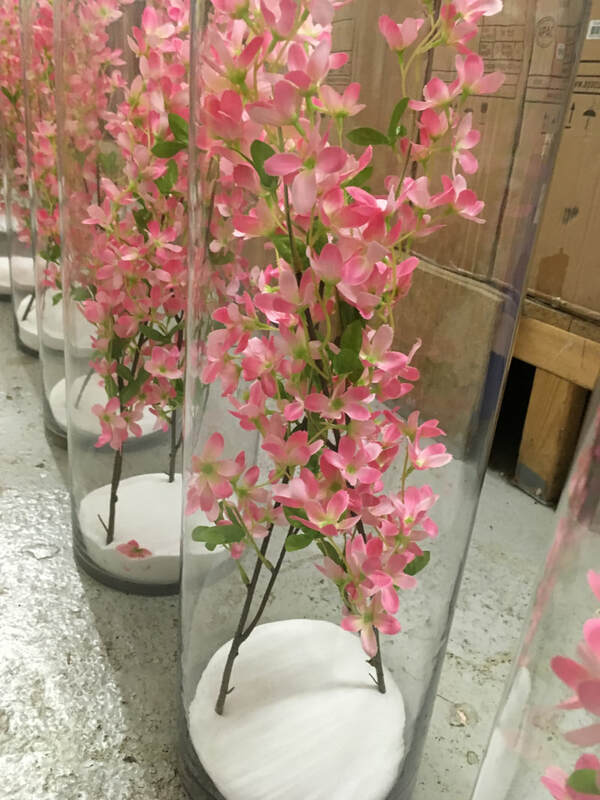 Each display sits on top of an LED light base; illuminating the vase as well as the display of blossom branches bursting from the top of the vase! Having a venue with high ceilings is a must for these displays, they stand approx 1.7m tall above the table. A stunning oversized blossom tree in pot with hanging baulbauls and LED candles in each. ​Standing at 1.7m high above your table! A wreath of artificial flowers adorns the base of the vase and an elaborate display of ivory, pale pink & Champagne orchids, peonies, roses and hydrangeas sits on top. Another addition to our tall oversize centrepiece range is this beautiful white & Ivory display standing at 1.3m high above your table! Placed on top of our 70cm Conic Stemmed Vase; A wreath of artificial flowers adorns the base of the vase and an elaborate display of white & ivory orchids, peonies, roses and hydrangeas sits on top. LED Base can be added to this display to make an amazing Evening Event Table Display to really give the WOW factor! Our beautiful artificial flower spray is perfectly suited to decorate the centre of your top table or even your registrar table!